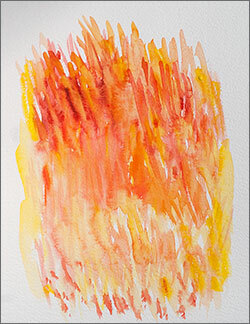 Watercolour painting techniques moves on to figurative exercises. Now at last a chance to sit down and paint something from Nature? Well, no - not exactly. There is an awful lot to learn about handling watercolour and it's best not to be attempting to represent things you are looking at, at this stage. Children become accomplished at handling their materials by making symbolic drawings and paintings (who ever saw a house like the one which all children draw?). If you have the added worry of making a good likeness, this is inhibiting and the sense of pleasure is lost. It is much better to experiment innocently, using imagination and a sense of design. I make my students paint the five basic elements at this stage. The first two are quite challenging being the most abstract and removed from observed reality. They need to be done in the context of a course with a teacher. Developing watercolour painting techniques takes time, so I suggest you attempt the last three. Mix up lots of oranges, reds, yellows and some pale green. Now paint lots of vertical and diagonal short lines on the paper with the various colours. Do this quite fast and think of the fire taking hold. It doesn't matter if the colours run, the effect is always lovely. Next, paint the sun. You can't paint the sun as it actually is because it is pure light and there are no pigments to express it. You have to paint the feel of the sun. So what you do is imagine the sun from the inside to the outer rim. It is white hot inside and then there are layers of darker yellows, oranges and reds. At the rim there are flames leaping in all directions. When you have painted them, you need to let the painting dry and then paint in so me sky round the flames to accentuate their shapes. The sky can be blue or black. After all that heat you need to paint some water. 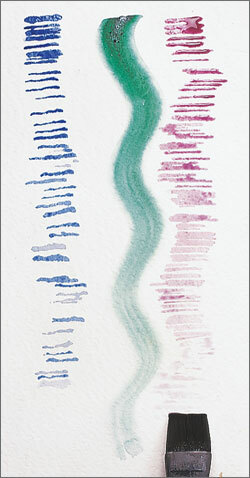 Mix up blues and greens and purples and dab on lots of horizontal lines. You can use the rim of your square brush for this. You can build up lots of ripples and reflections this way and you can finish up by putting on a layer of water to let the colours blend together. It is lovely painting water in its own medium! Imagine the earth cut in half and again paint from the inside to the out. 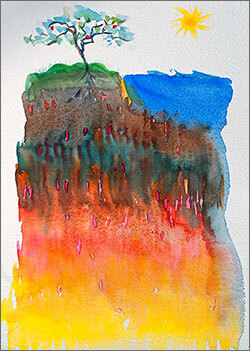 This time you start with fire and end up with water as well as lots of other things like trees and mountains. It is an all-embracing exercise.